This Amazon Brand – Presto! 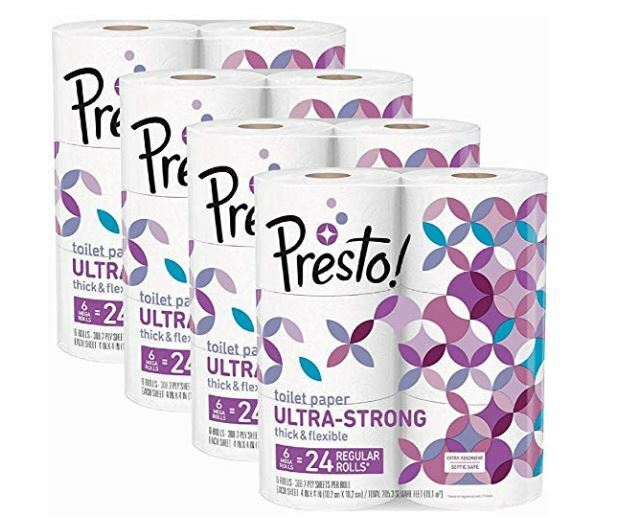 308-Sheet Mega Roll Toilet Paper, Ultra-Strong, 24 Count (96 Single Rolls) is on sale for $16.91 shipped when you subscribe and save. That’s just $0.18 per single roll! Presto! Ultra-Strong Toilet Paper offers great strength with the comfort you expect. This septic-safe bath tissue is up to 80% stronger than the leading 1,000 sheet brand. Each mega roll lasts 4X longer than a regular roll of toilet paper (based on a regular roll with 77 sheets). Presto! Ultra-Strong Toilet Paper is PEFC certified and made with pulp sourced from sustainably managed forests and controlled sources.